Cholesterol in excess has long been the culprit of fatty deposits lining the arteries. This is a dangerous condition that causes the arteries to become clogged and hardened. Eventually they will become so narrow that blood cannot flow through freely and heart disease, heart attack or stroke is the result. Until recently reducing cholesterol and controlling blood pressure were believed to be the primary factors that impacted this condition of the arteries. It is now known that heredity may have a greater influence than previously believed on where these deposits occur within the arteries. Controlling cholesterol and blood pressure are still vital, but this relatively new information can help doctors do better screening of patients with a family history of heart disease and focus their attention on where they are most likely to develop the plaque build up. In a 10 year study of 882 siblings from 401 families, researchers from the Medical College of Wisconsin observed families where one person from each family in the study had a heart attack before the age of 60 and one of their siblings had either a heart attack or some kind of preventative coronary surgery or procedure. When comparing the siblings with each other the doctors were able to see shared disease patterns. This implied there is some sort of genetic trend that would lead to the disease. The study took into consideration other risk factors for heart disease, including high cholesterol. When all extenuating circumstances were removed, there was still a genetic tendency toward siblings having the same disease patterns. The findings of all of these studies mean good news for people with a family history of coronary disease. They can better monitor cholesterol and stay on top of the risk factors to heart disease knowing they are at a greater risk and knowing just where that risk is highest. 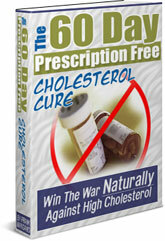 If you have been diagnosed with high cholesterol, you can lower cholesterol naturally using the proven methods found in The 60-Day Prescription Free Cholesterol Cure.